We have enabled our users to upload their own .csv file of contacts into their offrs account so that they can track their touches and reach out to them using their campaign allotments. Before the uploading can take place, a sphere must be created. Locate the 'My People' module to the left side of the page. Locate the 'Create A Sphere'. A menu will pop up. 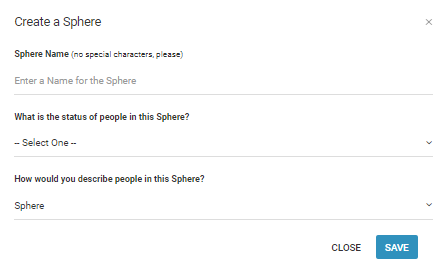 Fill out the sphere info: name, status, and description. A tag will be automatically created using your sphere name. This will allow you to locate your sphere leads from within the 'Lead Dashboard'. Note: Because the name of your sphere creates a tag automatically, please make sure you are not using any special characters such as hyphens, periods, commas, etc. Only use Letters and numbers. Search Terms: Creating, create, sphere, help, leads, lead, contacts, referrals, upload.